Wiley Hardeman Post was born near Grand Saline, Texas on November 22, 1898. He was a mechanical genius who fixed things around the farm growing up. When he saw his first airplane at a county fair in 1913 he knew that he wanted to be a pilot. An oil field accident in 1926 cost him his left eye, and he used part of the $1,800 settlement to buy his first airplane, a Curtiss Canuck. In his day he was as well known as Charles Lindbergh or Amelia Earhart. 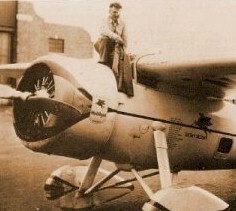 In 1933 he took off and landed from Floyd Bennett Field, now part of the Gateway National Recreation Area administered by the National Park Service. In addition to the around-the-world flights, Post flew the Winnie Mae during a series of special high-altitude research flights into the sub-stratosphere wearing a pressure suit of his own design. He reached an altitude of over 50,000 feet. Wiley Post died in the crash of a hybrid Lockheed Orion-Explorer floatplane near Point Barrow, Alaska, on August 15, 1935. His friend and companion Will Rogers also perished in the accident.